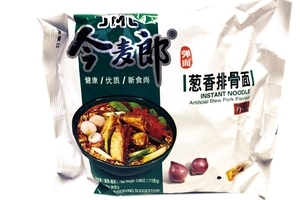 JML Artificial Stew Pork Flavor Instant Noodle in 3.99oz (113g) pack. Just add hot water to cook a meal in 3 minutes with this instant stewed pork noodle. You may also put some additives such as ham, shredded packled vegetable, sausage, or spicy sauces, etc to create a more wonderful meal. Product of China.